Value-based Holis HD Tribrid Video Recorders combine with a new suite of American Dynamics HD analog cameras to provide an affordable recording solution for any small to medium size business. By supporting 720P and 1080P cameras over coax infrastructure, Holis 4, 8, and 16-channel HD recorders take advantage of existing analog infrastructure to provide cost-effective installations while offering superior video quality never before attained over coax. The new suite of HD cameras – including fixed and varifocal Bullet Cameras and Mini-Domes – offers an excellent alternative to IP cameras and allows users to upgrade their system over time while protecting their CCTV investment. HD technology supports high resolution video (1080P/720P) over a coax infrastructure with transmission distances of 500m (1080p) and 800m (720p). 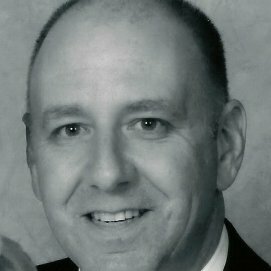 Initially proprietary, technologies appear to be moving to provide cross-functional support. The Holis HD Tribrid Video Recorders offer an affordable recording solution for any small to medium size business. 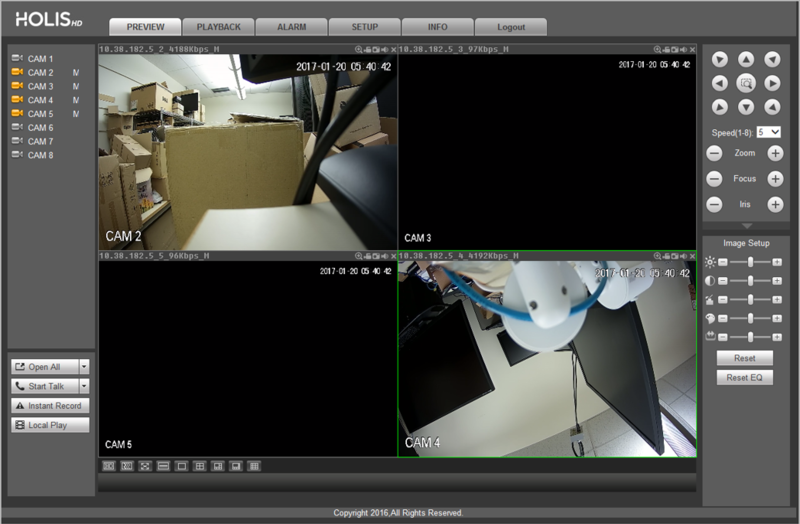 Holis HD is flexible by supporting HD analog cameras, SD analog cameras, and the Illustra Essentials line of IP cameras. The Holis HD recorders have easy-to-use features such as search, record, digital zoom, and export. 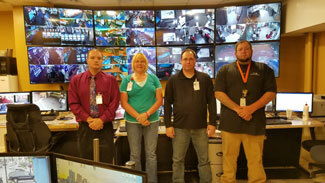 Holis recorders offer optimal surveillance flexibility for customers who require a recording solution at multiple sites. Holis recorders are ideal for remote locations that may be part of a larger organization. 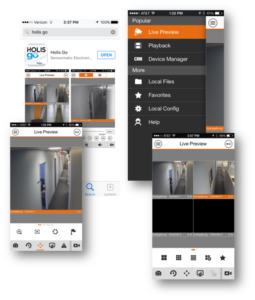 The Holis web client ensures continual surveillance, no matter how widespread your facilities are. Manage your video on the go with the full-featured Holis Go mobile app. 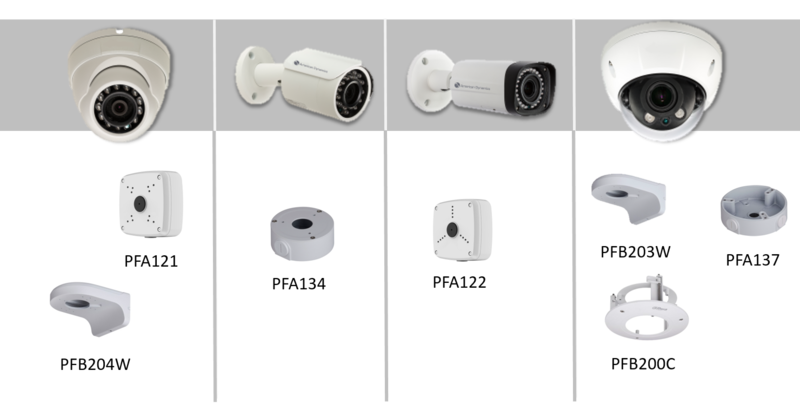 The suite of HD cameras – including Bullet Cameras, Mini-Domes, and Domes – offers an excellent alternative to IP cameras and allows users to upgrade their system over time while protecting their CCTV investment. Our fixed HD bullet and mini-dome cameras boast a 3.6mm fixed lenses and provide up to 1080p video resolution (1920 x 1080) in an uncompressed format over the same standard coaxial cable that is used for standard CCTV cameras. Where most dome cameras operate on two axes, the fixed mini-dome’s 3-axis feature has a much wider field of view and features Smart Infrared for recording over 196 feet away in total darkness. The IR bullet camera is waterproof, rated IP67, and features WDR making it an ideal solution for applications with volatile weather or lighting conditions. Our varifocal HD bullet and dome cameras feature a 2.7-12mm motorized lens and Smart Infrared for recording over 196 feet away in total darkness. Both cameras are waterproof, rated IP67, and features WDR making them an ideal solution for applications with volatile weather or lighting conditions. Additionally, the dome is vandal-proof (IK10). The new HD Analog cameras utilize the same mounts as the Illustra Essentials IP cameras. Learn more about Tyco Security Products new HD Video solution at HolisNVR.com. Designed for use with victor, the new surveillance keyboard is designed to improve video surveillance operation surveillance. Simply “plug and play” via the USB connection — the keyboard is automatically recognized by victor software. 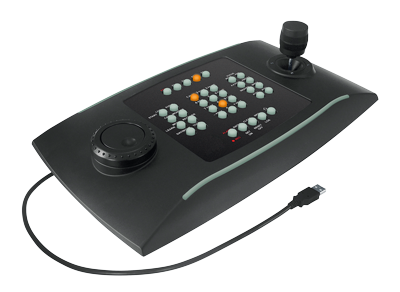 The surveillance keyboard offers greater control of PTZ cameras with an intuitive joystick. With 30 pre-programmed buttons mapped to victor’s most common controls, navigation is simple. Operators can program controls and call ups (guard tours, salvos, view switches) and change layouts. Buttons can be customized for specific security operation function. An intuitive joystick enables precision control of Illustra PTZ cameras, while the jog shuttle wheel quickly manages video, cameras and PTZ preset controls. With its LED backlit buttons, the keyboard is visible even in low lighting. American Dynamics has released a new version of the RAID Storage System for VideoEdge network video recorders (NVR). This includes enhancements to the NVR archived storage and improved battery back-up capabilities to reduce downtime and ensure your data is properly backed up. Using an American Dynamics RAID storage system gives users one unified solution to administer and monitor video storage and recorders. This single user interface reduces the complexity and cost of integrating disparate solutions. Learn more about our RAID storage system. The victor Go mobile app is now available for download for Apple and Android phones and tablets. This new app offers simple, intuitive operation to access live and recorded video from victor servers remotely any time of day. Whether you need to respond to a critical event at a moment’s notice or simply monitor your security operation remotely, victor Go can save you time. 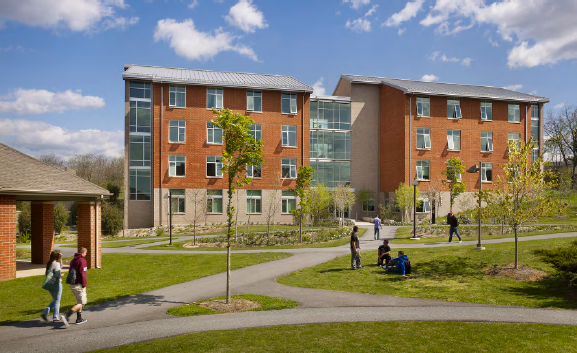 Simply log in to the victor Application Server via a highly secure connection from WiFi, 3G, or 4G. View up to six cameras, scroll through pages of camera views, instantly control PTZ camera positions, and digitally zoom in on any camera for a closer look. Search for recorded video, play back video, call up live cameras and a list of events – you can do it all. For added convenience, you can save camera views for quick reference. 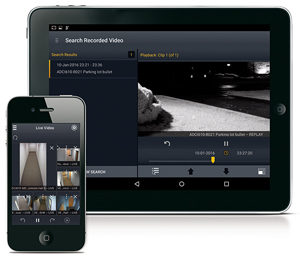 Use the Smart Search feature to search hours and hours of video recorded from VideoEdge NVRs in just seconds. 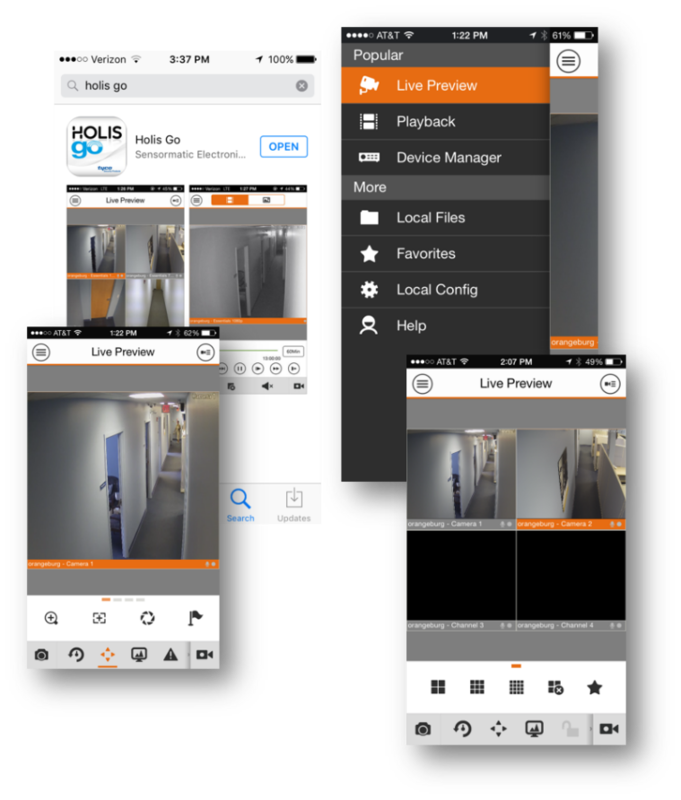 This purpose-built, 64-bit video surveillance app is designed to give you just the right video quality for a mobile device with the absolute minimum latency. 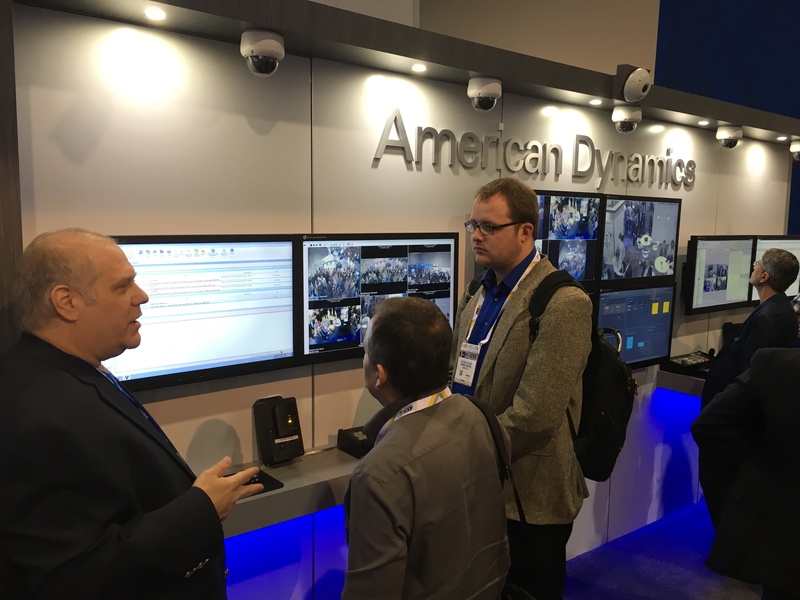 ISC West, held on April 6 – 8, 2016, drew large crowds to the Tyco Security Products / American Dynamics booth. We hope you had the opportunity to stop by and speak to our representatives on the latest American Dynamics features. In case you missed us, here’s a brief recap of all the new programs and functionalities demonstrated in the booth. 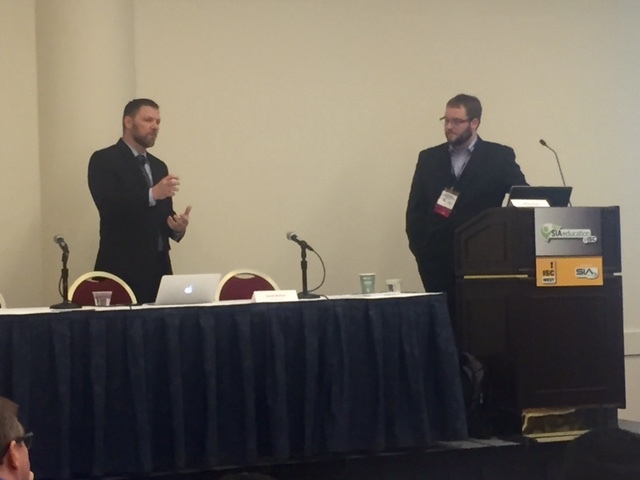 ISC West attendees received an advanced preview of the latest features being released in victor and VideoEdge version 4.8.1. Presentation Builder – Streamlines case management by consolidating all event documentation into one package for simplified evidence exporting and digitally authenticating video clips. Watch the short demonstration below as Chris Hanna shows the new victor 4.8.1 point-of-sale (POS) enhancement. Physical and cyber attackers have more sophisticated tools and understanding of network-based systems than ever before, shining a spotlight in particular on the vulnerabilities of security implementations for government and large, multinational customers. Download our cyber protection program guide to learn more. 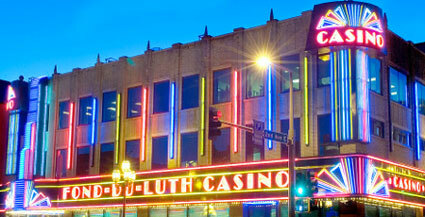 If you missed us at ISC West, feel free to reach out to your local sales representative to find out more.